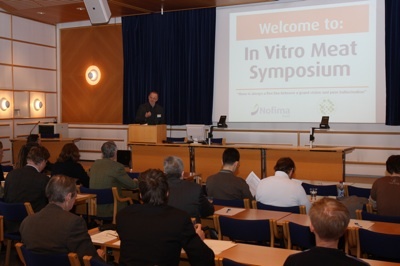 ▷ The First In Vitro Meat Symposium 2019: Is It a SCAM or Not? ???? 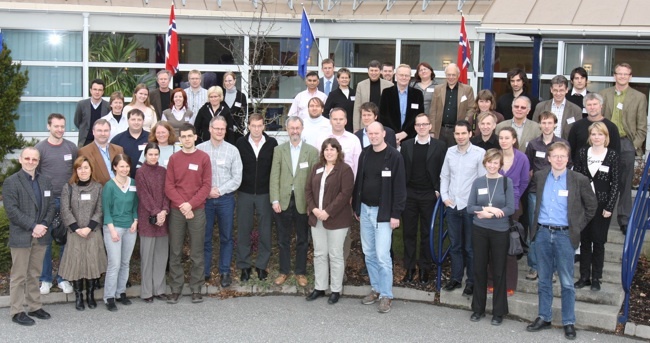 The symposium was held at the Norwegian Food Research Institute (Matforsk), Aas, Norway, hosted by the Norwegian University of Life Sciences (UMB) and the Norwegian Food Research Institute (Matforsk). The two main goals of the symposium were to identify and discuss the key scientific challenges that need to be solved and to formalize an organizational structure capable of binding together the various efforts as well as facilitating the funding of necessary activities. The talks were given by leading scientists and representatives from industry and organizations in the US and Europe (for further information see the Programme). The first evening a general introduction was given by Jason Matheny (New Harvest & Johns Hopkins Univ., USA), where he summed up the visions of whys, wherefores and what can be achieved by producing meat in vitro. He addressed in particular animal welfare, in addition to human health issues related to meat consumption and environmental issues. The next speaker was Elizabeth DeCoux (Florida Coastal School of Law, USA) who also addressed the importance of animal welfare, and she gave several good examples of how organizations have forced the meat industry (e.g. McDonald’s) in the US to become more conscientious regarding animal welfare. On Thursday, the sessions were divided into the different areas of expertise needed regarding in vitro meat production: 1) large scale production of cell culture medium, 2) stem cell separation, creation, large scale proliferation and maintenance, and 3) large scale muscle tissue engineering. In summing up Thursday’s presentations, the main obstacle would appear to be to define the right type of stem cell to use for large scale production of cultured meat, and thus define the end product (ie. minced meat vs. muscle tissue). There is also a need for developing a process technology (ie. large and complex engineering plants) for the efficient large scale production of muscle tissue from stem cells. • developing the process technology for the efficient large scale production of muscle tissue from stem cells. • developing cheaper and larger volume sources of growth medium that do not contain animal products. The discussion then proceeded to the organization of the In Vitro Meat Consortium, where Stig Omholt presented an organizational roadmap describing the vision statement, organizational structure, consortium rules and funding strategies. He proposed that the purpose of the international non-profit consortium should be to promote scientific excellence and to coordinate and fund research contributing to the establishment of a large-scale process industry to make engineered muscle tissue for human consumption. However, since the legal structure of this consortium is not in place, the interim steering committee should continue to strive towards the goal of formally establishing the foundation of this consortium. The original steering committee was expanded to include Jason Matheny (New Harvest & Johns Hopkins Univ., USA) and Henk Haagsman (University of Utrecht, Netherlands), in addition to Stig W. Omholt (Chairman, Norwegian University of Life Sciences, Norway), Willem van Eelen (Vitro Meat BV, Netherlands), Bernard Roelen (University of Utrecht, Netherlands), Gunnar Kleppe (Norwegian Bioindustry Association, Norway), and Jose Teixeira (University of Minho, Portugal).